We were at Luxor in the off-season and there were VERY few tourists, and only a handful of Indiana Jones style archeologists scattered amongst the ruins. We had made prior arrangements for a personal tour guide and Osman did not disappoint. He's the small but brilliant dragoman at the far right in the photo. Osman took care of our every need for several days, in this case bringing box lunches and a tablecloth (furnished by the hotel) for us to eat among the ruins. 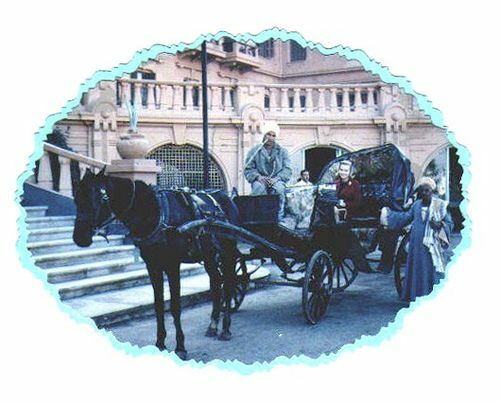 He arrived on this particular day with this carriage to take us from the hotel down to the dock where we would board a tiny, rickety boat to cross the Nile - the first step on the day's itinerary.